Hooray! 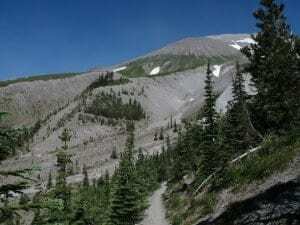 One of my favorite Mount Saint Helens hikes is back. 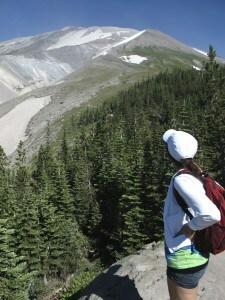 And I can’t wait to put it back into my book, 60 Hikes Within 60 Miles of Portland. 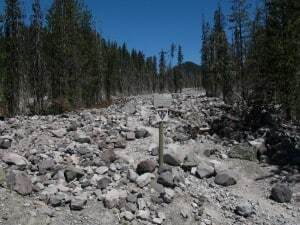 Road and trail washouts have, for years, meant off-and-on access to the Sheep Canyon / South Fork Toutle River Hike, one of my favorites. 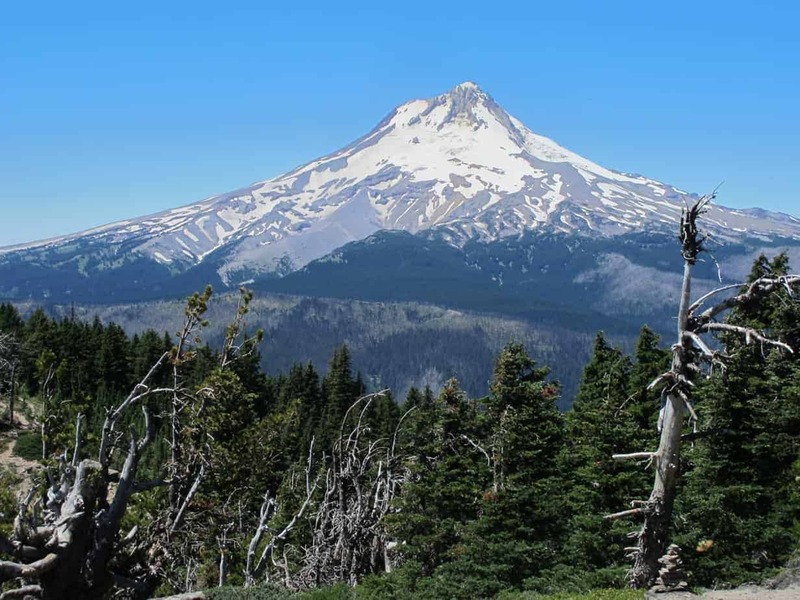 There are still some adventures involved here, and a 90-minute drive from Portland, but the variety of scenery, plus the up-front look at the results of the 1980 eruption, make it so worthwhile. 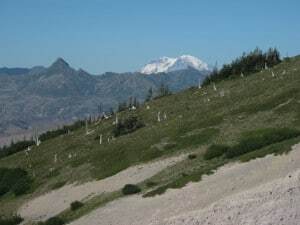 Mount Saint Helens hikes are known for their variety of scenery: It’s a Cascades volcanoe, so it will have views and flowers and meadows and creeks. But it also mostly blew up 33 years ago, so here you get to see the results of that massive eruption. And on this hike, you get it all: old-growth forest, big-time views, alpine splendor, dramatic canyons, everything. 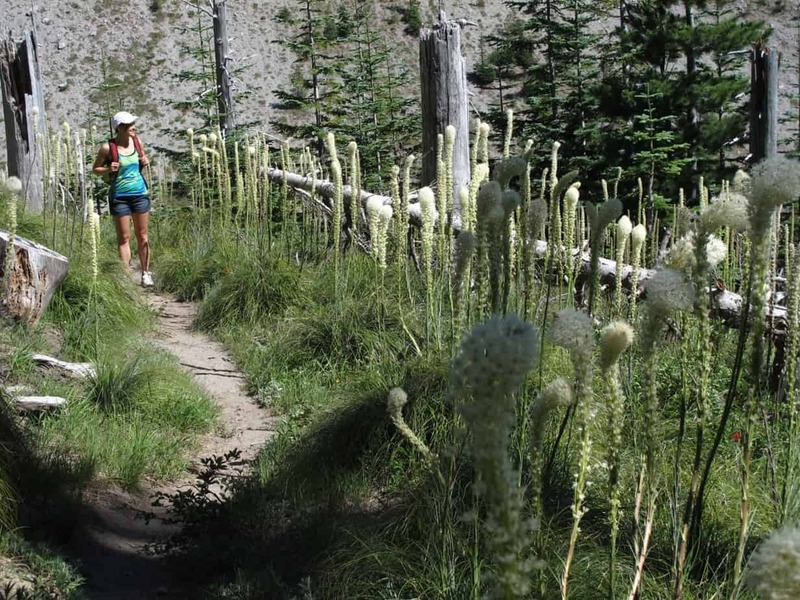 Beargrass on the upper trail. 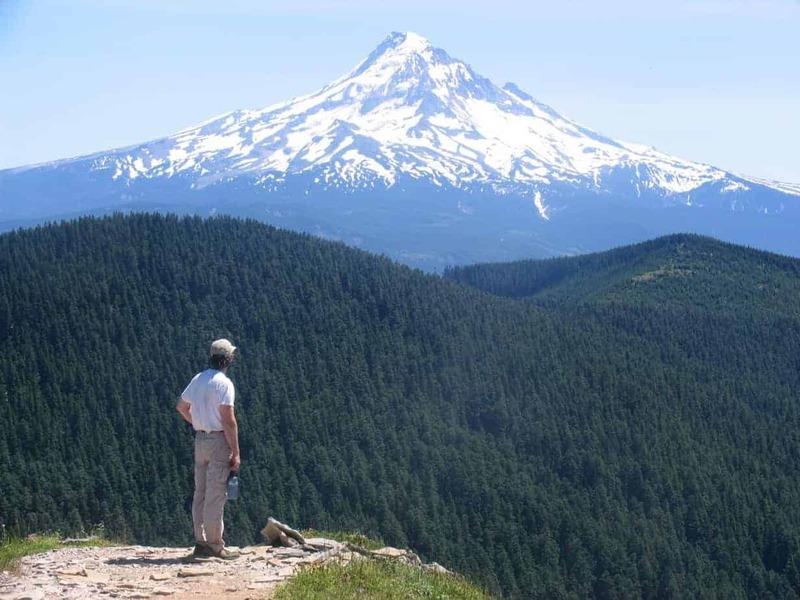 From Portland on I-5, drive 21 miles north of the Columbia River and take Exit 21/Woodland. Turn right onto WA 503 (Lewis River Road) and travel 28 miles, then turn left onto FS 8100, between mileposts 35 and 36, following a sign for Kalama Recreation Area. Travel 12 miles on FS 8100, then continue straight onto FS 8123 for two miles to the Blue Lake Trailhead at the end of the road. You start out on a trail hacked through the most recent mudslide. After 0.6 mile, look for a crossing of a tiny creek up against that ridge (ribbons marked a good one when I visited), then scramble up the other side to find the original trail in the woods. In just minutes, you’ll pass well above Blue Lake, visible through the trees, then go slowly up and over a low ridge through a beautiful old forest. After 2.1 miles, start down and pass through a meadow, then drop down 0.9 miles to arrive at the Sheep Canyon Trail, coming up from the left (from an old, road-end trailhead cut off in 2003). For the recommended loop, which will come back that way, turn right and immediately cross a lovely creek with the route’s only campsite. Past that, you climb gradually through a lovely forest and into spectacular alpine high country. You’ll gain 850 feet in 1.3 miles to reach an intersection with the Loowit Trail, which goes all the way around Mount St. Helens. Loowit Trail goes around the mountain. Turn left here, drop down about half a mile to traverse an ash-filled ravine with a wetland below you, then climb half a mile through a wonderful subalpine area of firs and hemlocks. 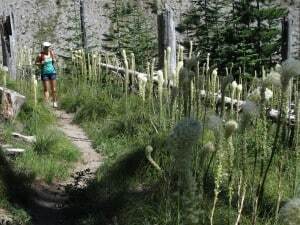 In July there will be beargrass going wild, in August the place will be ablaze with flowers, especially blue lupine, and in fall the mountain ash and other plants will roar with color. And the views up here, at the foot of the mountain, are splendid. This is a fantastic stretch of trail! View from the big boulder on Loowit Trail. Just over the hump of a small ridge, you’ll come to a big viewpoint on a boulder. 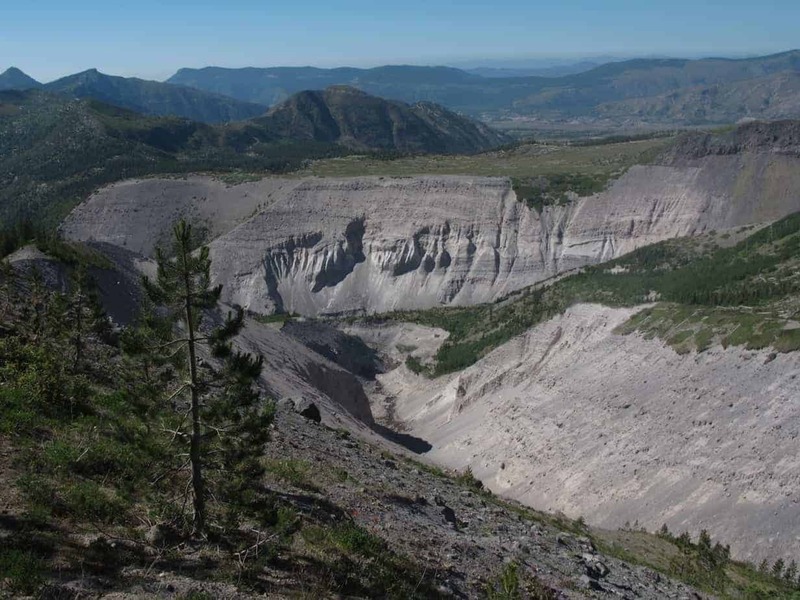 The South Fork Toutle, some 800 feet below you, is in the process of recarving its way through the 1980 mudflow. The drainage right at your feet was wiped out, too, when glaciers melted instantly. The contrast between your side of the canyon and the other side, well within the blast zone, couldn’t be more stark. 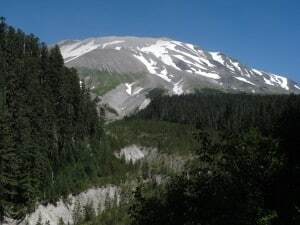 Looking across the blast zone at Mount Rainier. 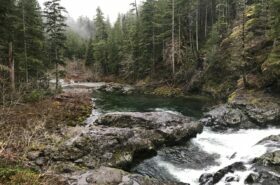 The trail now turns downhill, descending Crescent Ridge, for 1.6 miles to a junction with the Toutle Trail #238B, just above the South Fork. It’s in this stretch that the trail gets brushy and the tread is poor in places, so take your time to be sure of your footing. Explore to the right of the junction, checking out the mini-gorge the river has cut into the mudflow. 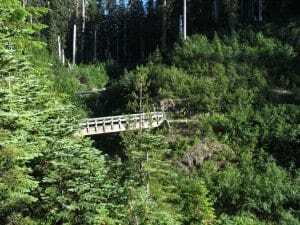 Then go back to the Toutle Trail and follow its brushy and uneven path through old-growth forest. 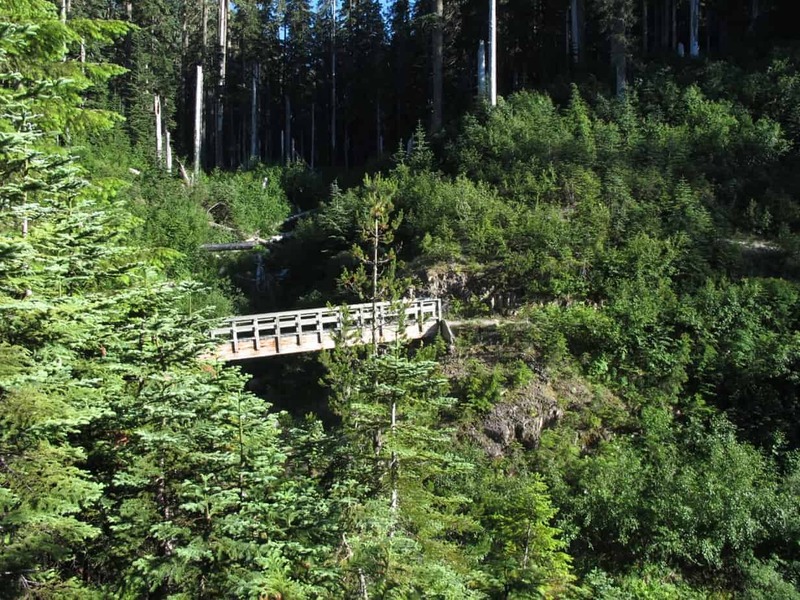 You’ll climb over a small ridge in old-growth forest before arriving at the bridge over Sheep Canyon after 1.5 miles. Sheep Canyon was also gouged out by the 1980 eruption, and for what it’s worth, this bridge is my girlfriend’s favorite hiking spot. Cross that spectacular span, then stay straight at the junction to retrace your steps 3 miles back to the car. 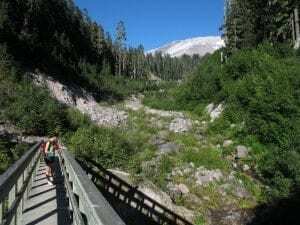 SCENERY: Old-growth forest, waterfalls in canyons, flower-filled meadows, a close-up view of Mount Saint Helens and its eruption aftermath. TRAIL SURFACE: Rocky in places, packed dirt with roots, occasionally brushy and a poor tread. One bridgeless (small) stream crossing. BEST TIME: August–September, aka NOW! BACKPACKING OPTIONS: One nice site on the loop, others nearby on the Loowit Trail. INFO: Mount St. Helens National Volcanic Monument, 360-449-7800.